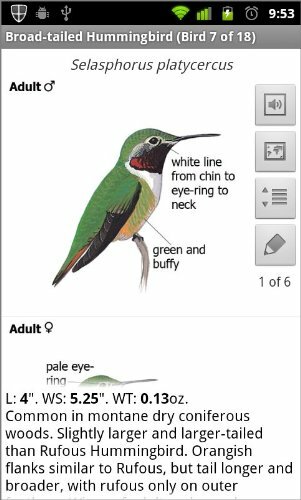 The Sibley eGuide to birds was recently adapted for the Kindle Fire tablet (and still works on other Android OS devices). You can find it at the Amazon app store. In other news an update for the Android OS is coming soon that will (among other things) remove the annoying requirement to verify over the network every 45 days, so the app will be fully functional and never need a network connection except once when it is installed. Also, the developers tell me to expect an announcement about a Windows Phone 7 version soon. Broad-tailed Hummingbird as it appears on the Kindle screen. 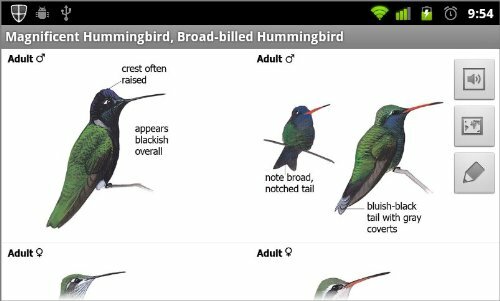 Magnificent and Broad-billed Hummingbirds using the "compare" feature in landscape mode on the Kindle Fire. i am an active bird watcher and have recently received a kindle fire hd7. also bird pro the newest addition. Hi Rosemary, Thanks for your interest. There is an app of the complete Sibley Guide (plus audio) and it should be available for Kindle soon. There is no plan for an ebook version of the field guides, but there is an ebook edition of Birding Basics.